On Friday 16 May in Bergen on the island of Rügen, the Chancellor of Germany Angela Merkel took part in the official presentation of the project called "E-Mobility Rügen", introduced for the first time at MobiliTec at the trade fair of Hannover by Rolf Hoffmann (Kabel + Sat Bergen) at the booth of the association BSM (Bundesverband Solare Mobilität e.V.). This significant pilot project was finally presented last Friday in its natural location, the marvellous island of Rügen in Northern Germany. 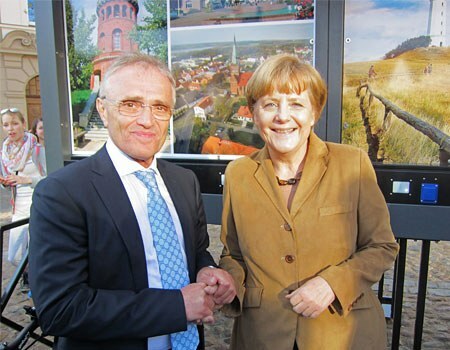 Mrs. Merkel, attending the event in Marktplatz, the main square of Bergen (Rügen) let amongst others the Mayor, Mrs Andrea Köster, and the representative of the tourist centre of Rügen (TZR), Mr Kai Gardeja, clarify the plans of the island for the coming years. The company Giulio Barbieri S.r.l. is honoured to announce its partecipation in this significant project: it is the only non-German company to be involved in due to its innovative charging solution for electric bicycles called OASI SOLEVENTO" . The bike station offers the possibility to gather the energy generated from the synergy of solar and wind sources, to store it in batteries and finally to supply it, when necessary, to charge electric vehicles. A peculiar feature that makes this charging station unique is the presence of large spaces suitable for the installation of advertising panels, tourist boards or high visual impact LED videos. This project will be a model to be spread in Germany and possibly across Europe. Angela Merkel has also appreciated the bench MICARICA: the first multimedia seatbench that offers the possibility to recharge mobile phones and provides the user with internet access. In addition, the municipality of Rügen is also wondering about the fact of integrating the bench in socio-cultural activities promoted by the municipality itself. 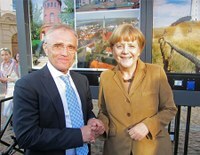 It can be said that Giulio Barbieri is part of the German Chancellor's plans regarding sustainable mobility. This important event is a good luck charm for the company that foresees in the short run to sign new contracts to supply additional charging stations. It represents above all a prestigious reference opening the door to new international markets; as a consequense, it means work and development for the Giulio Barbieri company in the area of Ferrara.